These buses were the last ones purchased before the introduction of the Leyland National the following year. This order for 40 was for the shorter 33 foot single door layout model, earlier ECW bodied RE’s had been for the dual door 36′ version. With the exception of 4 for Lancaster and Morecambe they were all initially allocated to depots in the southern half of the Ribble area. 338 spent time at Preston, Blackpool Talbot Road, Kendal and then to Bolton depot when it reopened following deregulation in October 1986, it then became a ‘spare’ vehicle in January 1988, finally being withdrawn in May 1988. In 1989 it went to Citybus in Belfast as their 764 , being withdrawn by them in September 1990. It then passed to the Northern Bus company at Anston (171) before being acquired for preservation a member of RVPT in 1992. Restoration work began late in 2001 being completed in 2004 and involved a complete mechanical overhaul, new floor and treadmaster floor covering, repanelled below the windows, new cream window rubbers fitted, repainted in Ribble Red with a cream band and vinyl fleetnames applied. Two other vehicles of the same batch 350 and 354 were canibalised to provide parts for the restoration. 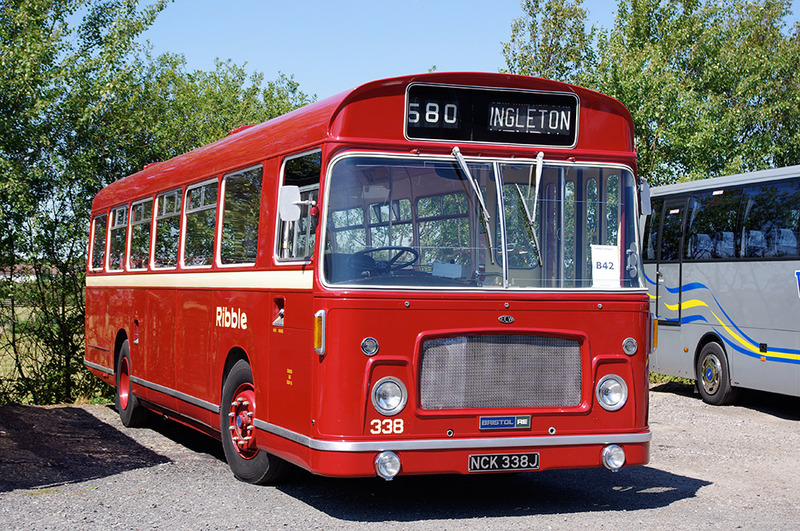 338 won the best preserved bus “Shillibeer” award at the 2004 Showbus Rally held at The Imperial War Museum at Duxford, Cambridgeshire. It remains in regular service with RVPT.